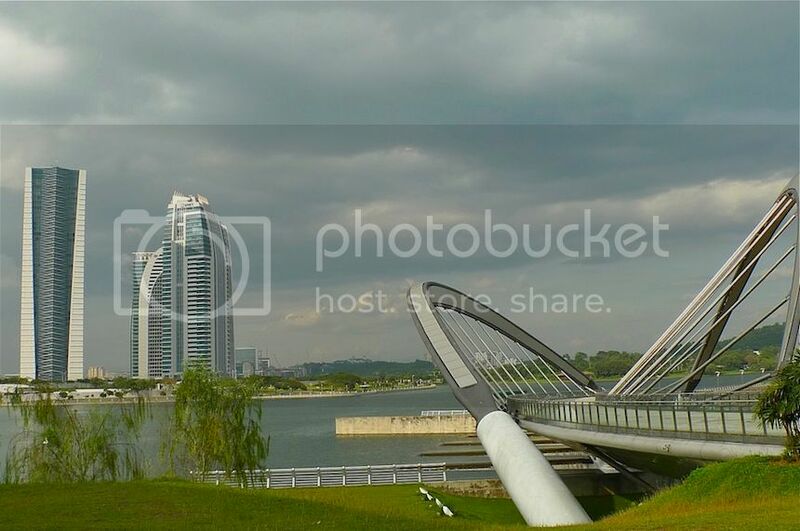 Last year, I started to blog about the bridges of Putrajaya, a city located 25km south of Kuala Lumpur. 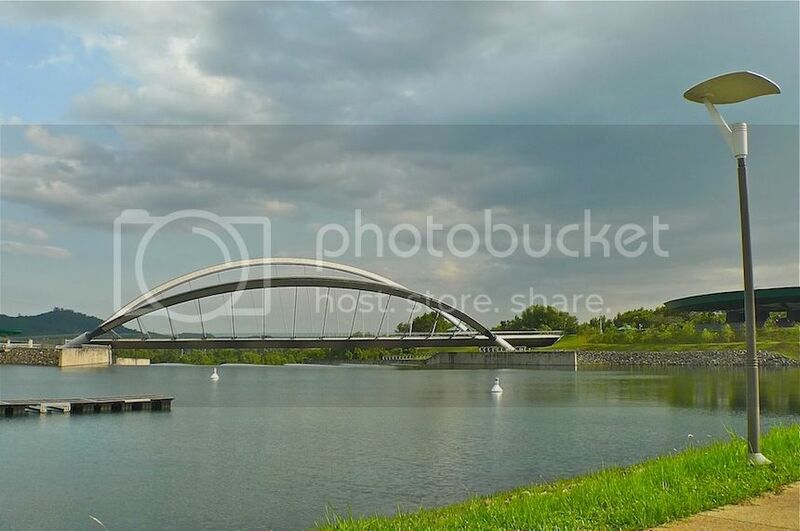 There are altogether 9 bridges spanning the man-made Putrajaya Lake, and I have only mentioned about 2 of them. My sincere apologies to readers who have been waiting so long for my Bridges of Putrajaya series. 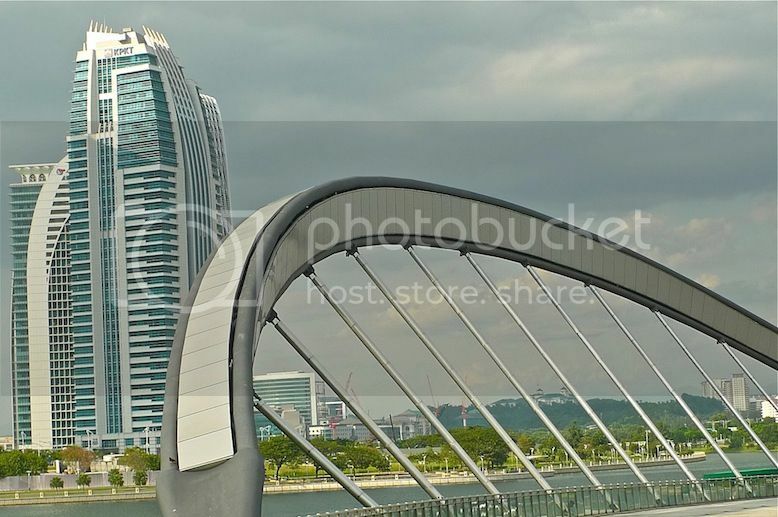 After almost a year, I guess it's time to resume blogging about the remaining bridges, so today, I shall continue with another bridge simply called the Pedestrian Bridge. 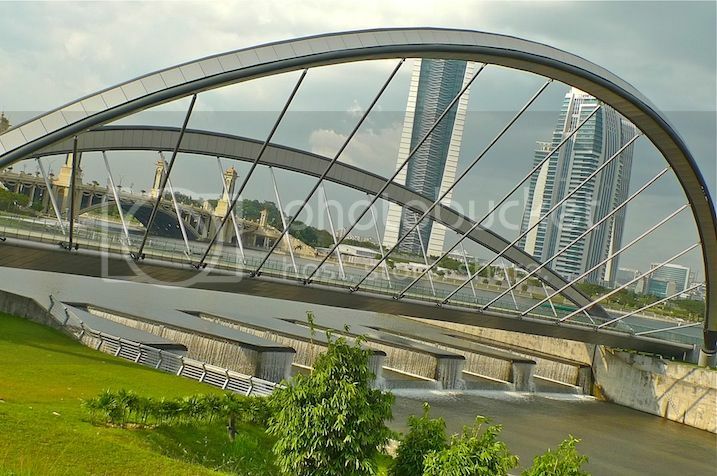 This bridge is very near to the Seri Gemilang Bridge and in fact, the photo above was taken while standing on the Seri Gemilang Bridge. 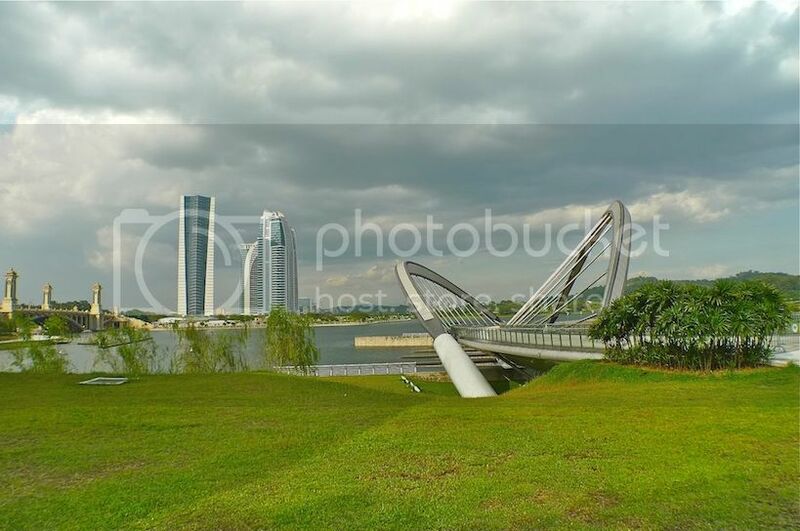 It is a very short bridge, only about 135 metres in length. The weather was really cloudy which made it hard to take good photos. 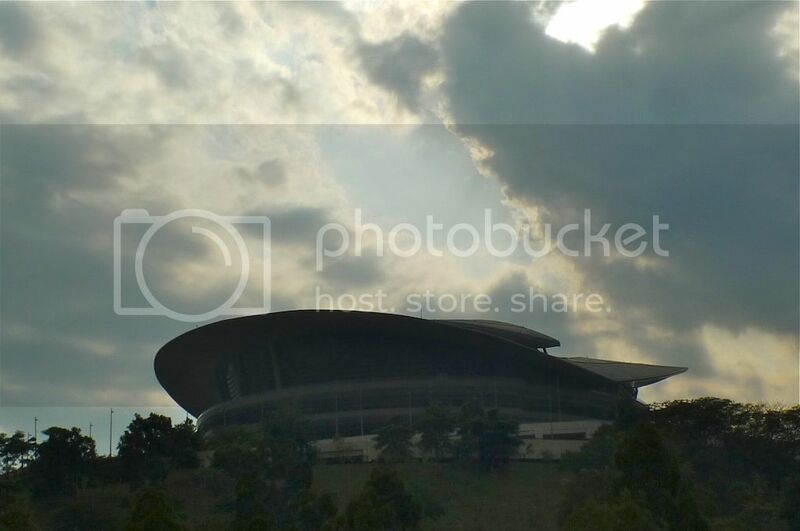 As I walked towards the bridge, I could see far ahead and above me, the iconic UFO-shaped Putrajaya International Convention Centre (PICC) building. There were actually dark clouds gathering in the sky and I prayed it would not rain as I did not bring an umbrella with me. Reaching the front part of the bridge, I was surprised to see that it was barred and there was a 'No Entry' sign. 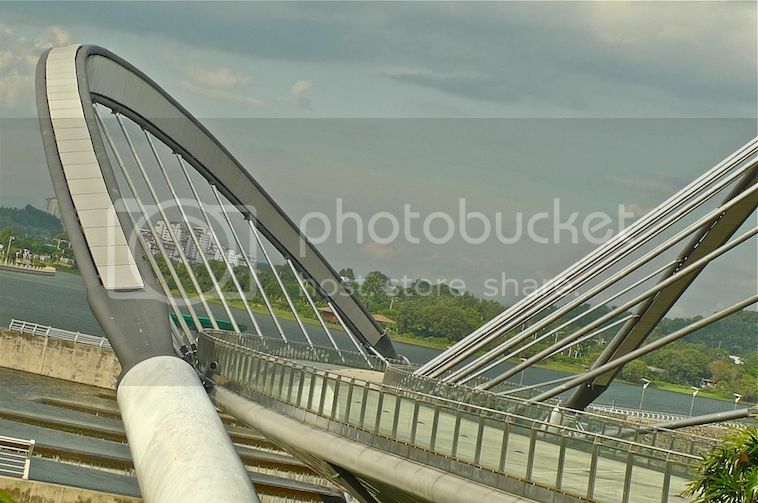 Somewhat resembling a butterfly, this bridge is actually a pedestrian or footbridge specially designed for pedestrians and cyclists crossing the Putrajaya Lake to enjoy the scenic beauty of the surrounding area. 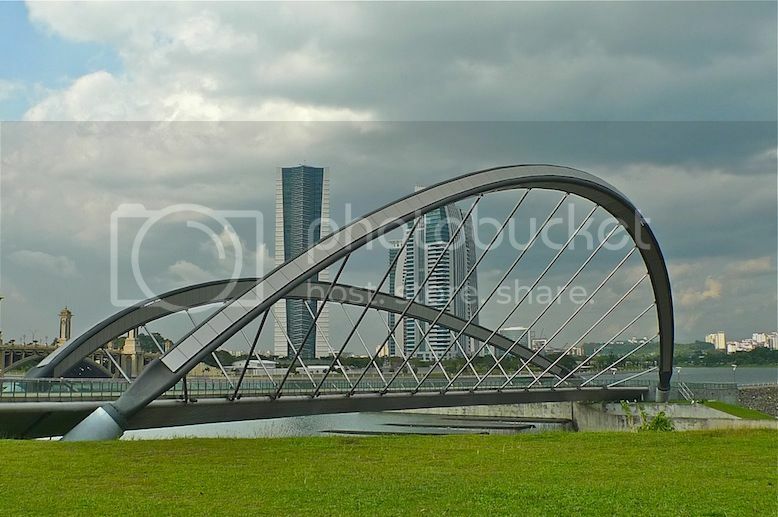 I love the design of this unique looking bridge, but too bad I was not able to walk on it that day! I wondered if the bridge was temporarily closed for some reason or it was no longer in use - anyone knows? 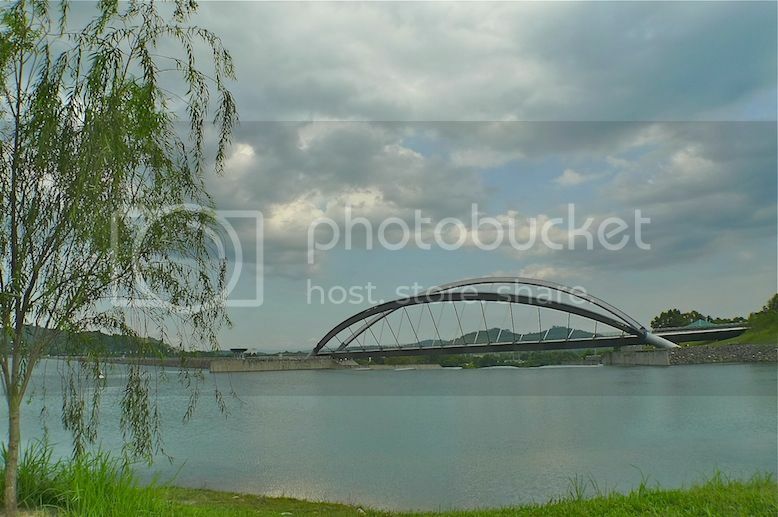 It would be a great pity if such a nice bridge is closed down for whatever reasons. Since I visited this bridge last year, things may have changed recently. 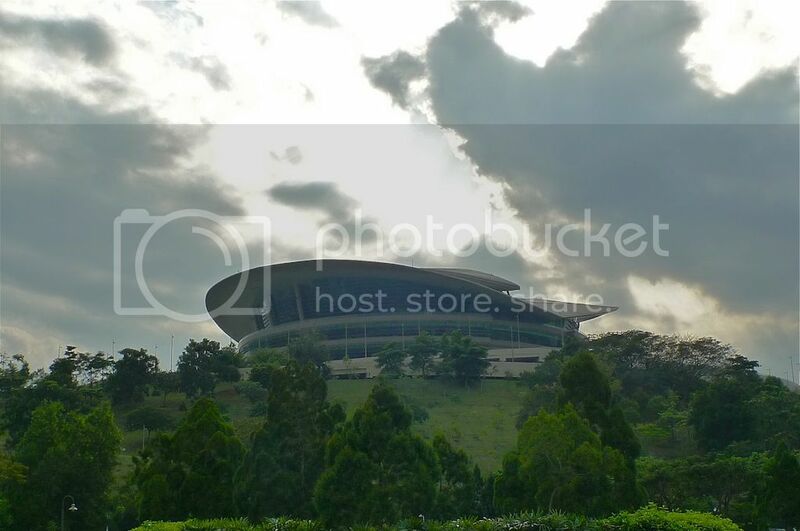 Maybe I should visit it again soon. 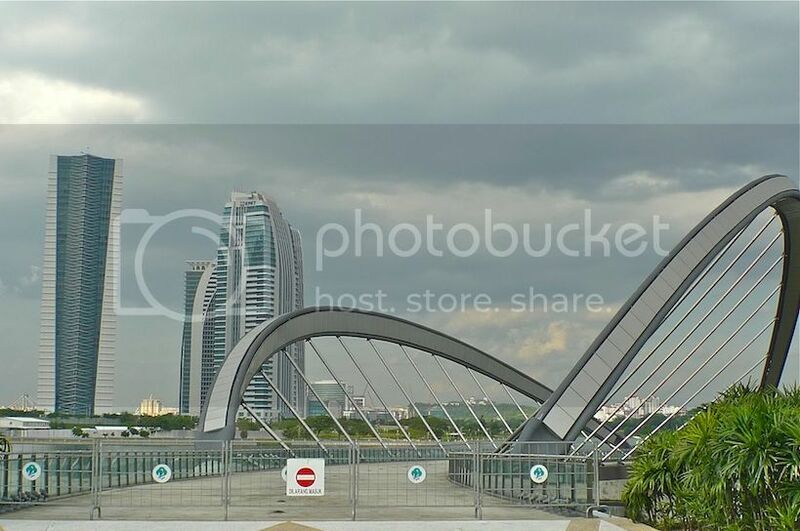 I continued to walk further to take photos of this bridge from different angles. 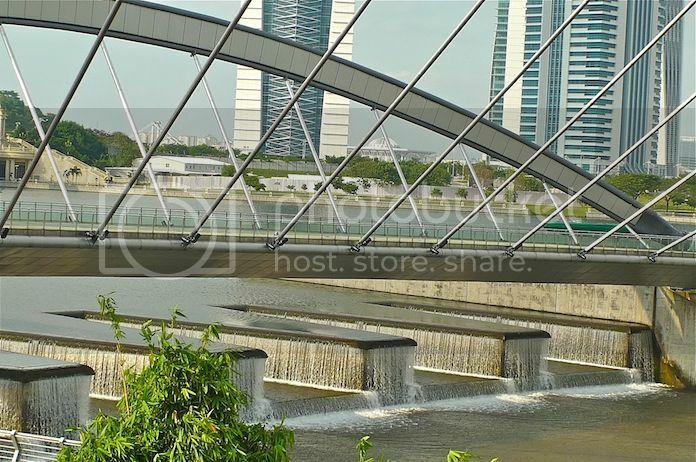 Then I saw the waters of Putrajaya Lake dropping to another level right below this bridge! A magnified shot of the water drop. I guess this must be some sort of a dam. What do you think? 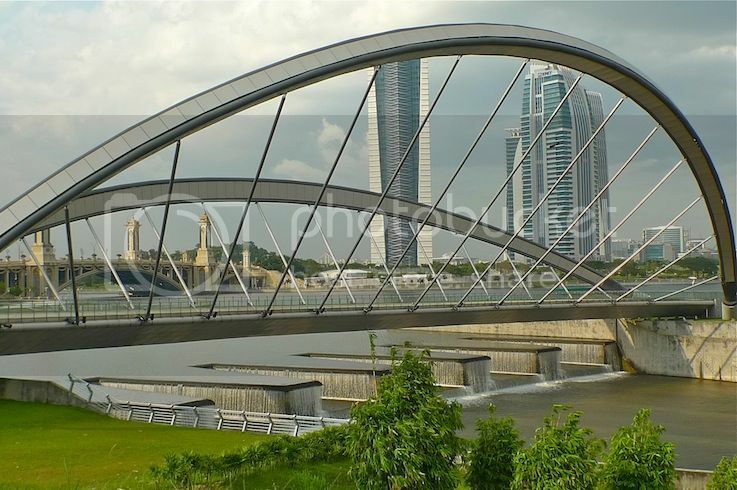 Built as a double asymmetrical tubular arch bridge, the design was pretty unique, at least in Malaysia. 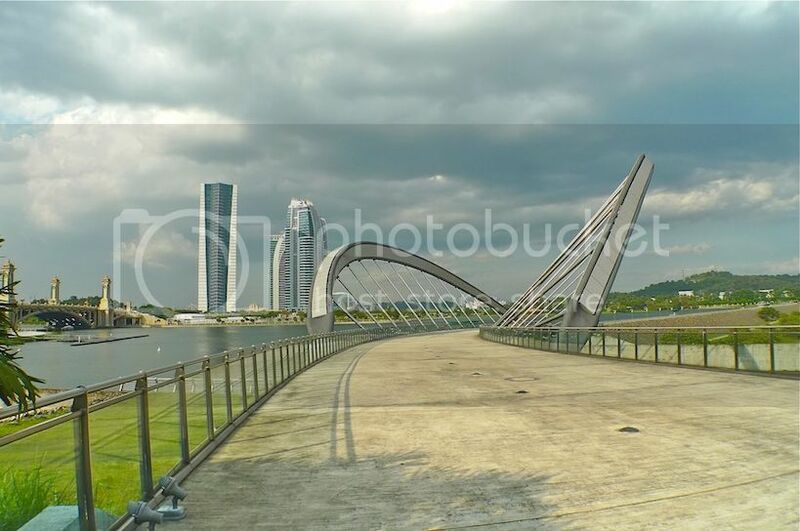 Located at Precinct 5 at the southern part of Putrajaya, this pedestrian bridge no doubt adds to the beauty of the scenic Putrajaya Lake. 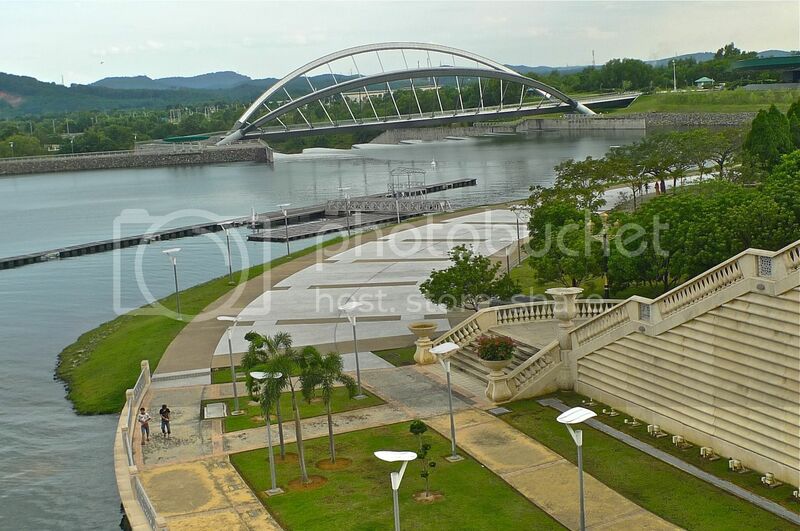 I wish I could go here for my morning jog, but unfortunately Putrajaya is just way too far for me to go everyday or even a few times a week! I spent about half an hour walking around taking in the sights. Luckily, the rain did not come although dark clouds continued to hover above. But I was not taking any chances. I decided it's better to get back to my car which was some 15 minutes walk away. 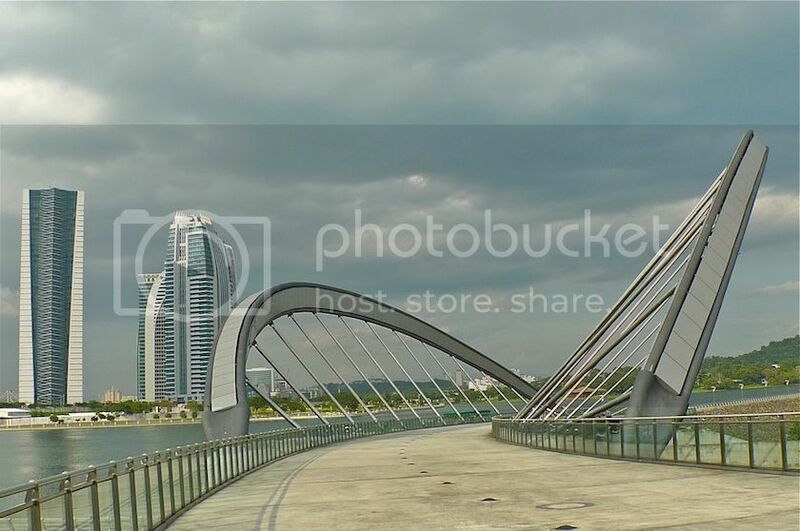 And before it really pours, I had better get on to the next magnificent bridge of Putrajaya!